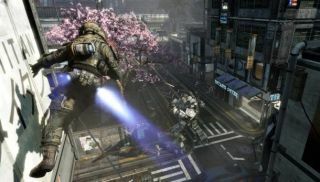 EA have uploaded a twenty minute Titanfall presentation made at the recent EB Games Expo in Australia. Hosted by Respawn community manager Abbie Heppe, the footage contains action, pathos, a few awkward silences, and the brilliant bit where a robot unceremoniously grabs a person and stuffs him inside of itself. It's a docking procedure that will henceforth be referred to as "Automanoms". You too can be automanommed when Titanfall is released early next year.